Aaron Donohoe studies global scale climate dynamics with a focus on how energy moves through the climate system via radiative and dynamical processes. Large scale energy fluxes control the spatial-temporal distribution of atmospheric and surface temperature, the hydrological cycle and the strength and location of storm tracks (i.e weather systems). His work attempts to understand the controls of climate and climate variability from the perspective of global scale energy fluxes in the atmosphere and ocean. 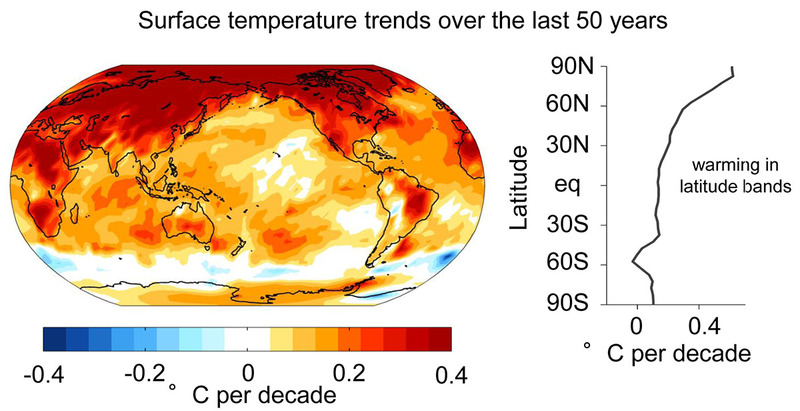 Southern Ocean warming – The spatial pattern of temperature changes over the last several decades shows a pronounced contrast between the high latitudes of the two hemispheres; the Arctic warmed more than any other region on the planet, whereas the Southern Ocean adjacent to Antarctica has actually been cooling on average (Figure 1). Given the widespread evidence of increased greenhouse forcing and associated global energy imbalance resulting in energy accumulation in the climate system at the global scale, a key question is, why hasn’t the Southern Ocean warmed? Previous explanations of this climate paradox include: 1. deep mixed layers in the high-latitude Southern Ocean allowing heat taken up at the surface to be stored at depth 2. increased surface westerly winds associated with ozone depletion resulting in stronger equatorward oceanic advection of cold water, or 3. surface freshening due to enhanced rainfall or glacial runoff resulting in less upward mixing of heat from warm sub-surface water. Figure 1. Spatial pattern of sea surface temperature trends since 1950 calculated from NOAA’s Extended Reconstructed Sea Surface Temperature version 3b (Smith et al. 2008). A new study argues that the climatological ocean overturning circulation is responsible for delayed Southern Ocean warming. Circumpolar surface westerlies continually advect surface water equatorward and pull deep, old water — which has not been exposed to the surface for centuries—up to the surface around Antarctica. As a result, as the surface waters of the high-latitude Southern Ocean are heated, they are continually advected equatorward and replaced by the deep, old water that has not been impacted by decades of anthropogenic climate forcing. Indeed, large quantities of energy are entering the high-latitude Southern Ocean, but this energy ends up accumulating in the water column in the lower-latitudes of the Southern Ocean, on the equatorward flank of the Antarctic Circumpolar Current (Figure 2). As a result, the high-latitude Southern Ocean will take centuries to warm despite the surface energy input, even in the absence of changing winds or freshwater sources. Figure 2. (A) 30 year trends of the ocean heat uptake (blue) and full-depth ocean energy accumulation (red) in historical CMIP5 simulations (1982-2012) — units of ZJ per degree latitude band per decade. The shading indicates one standard deviation spread across the ensemble of models. 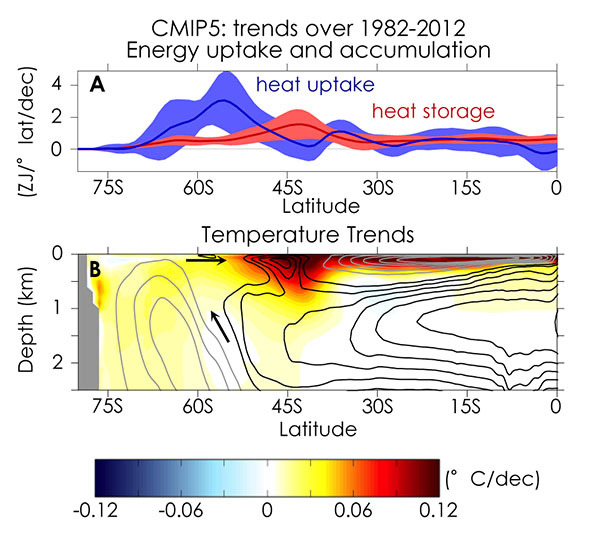 (B) Depth-latitude cross section of temperature trends over the same period co-plotted with the climatological meridional overturning streamfunction (4 Sv contour interval) with sense of motion indicated by the black arrows. Bandoro, J., S. Solomon, A. Donohoe, D. Thompson, and B. Santer, 2014: Influences of the Antarctic Ozone Hole on Southern Hemispheric Summer Climate Change. J. Climate, 27, 6245–6264.